As can happen in moments like these, the external world suddenly comes into sharp focus. Two young couples are sharing another table in the coffee bar, and a dispute has erupted between the two women, respectively named Lou and Thomasina. Suddenly the fight becomes physical: Lou is actually tearing Tommy’s hair out by the roots! Eventually the uproar subsides and both couples depart the coffee bar. Mark himself leaves shortly thereafter, intending to put the incident out of his mind. But a week later, while reading a newspaper, he spots an obituary for Thomasina Tucker. According to the notice in The Times, a brief and virulent illness carried the young woman off. But Mark does not have time to ruminate on the implications of this sudden and unexpected death. He must attend to his own affairs. Chief among those is the need to pay a visit to a friend of his , the writer Ariadne Oliver, in order to beg a favor on behalf of his cousin Rhoda Despard. Rhoda lives in the village of Much Deeping, where a church fete is soon to be held. Could Mark convince Ariadne Oliver to come and sign her books at this fundraising event? This interlude serves as delightful comic relief, and it’s hard not to think that Ariadne Oliver is actually a stand-in for Christie herself. While all of this comparative levity is taking place, events of a decidedly more sinister nature are unfolding elsewhere in the city. Father Gorman, a parish priest, has been called to the bedside of a dying woman. Mrs Davis requires that the last rites be administered, but that is not all. She also has an urgent need to unburden herself of a terrible secret. She gives Father Gorman a list of names and pleads with him to take action regarding them.The priest’s possession of this information seals his own fate. When we next encounter Mark Easterbrook, he has been to see MacBeth at the Old Vic, accompanied by his lady friend Hermia Redcliffe. After the performance, Mark and Hermia dine out at a restaurant called the Fantasie, where they meet up with Mark’s friend David Ardingly, a lecturer in history at Oxford, and David’s date, a seemingly vacuous young woman called Poppy. “That scene with the doctor, after the sleepwalking scene. ‘Canst thou not minister to a mind diseas’d?’ He made clear what I’d never thought of before – that he was really ordering the doctor to kill her. And yet he loved his wife. He brought out the struggle between his fear and his love. Shortly thereafter, the subject of how to arrange a murder for hire comes up. David exclaims, “How convenient if you could ring up Harrods and say, ‘Please send along two good murderers, will you? '” This quip causes laughter all around. But then Poppy offers this rejoinder: “But one can do that in a way, can’t one?” This renders the entire party speechless. When David presses her to explain herself, she mumbles something about the Pale Horse. The others remain stupefied. The topic is dropped. At any rate, the fete is a great success. Mark has been staying with his cousin, and they all decide to visit a few of the village notables. One is a Mr. Venables, a deeply cultured man disabled by polio some years back. The party then proceed to visit three rather strange women who live in a sort of deconsecrated pub.They are Thyrza Grey, Bella Webb, and Sybil Stamfordis. They’re famous, among other things, for the seances they hold. They have retained the name of the former pub as the name of their dwelling place. That name is: The Pale Horse. Echoes of the three witches from MacBeth? Most assuredly. It would be hard to say more about the plot without giving too much away. Instead, I’d like to focus on the various aspects of this novel that made it, for me at least, such a terrific read. The Pale Horse comes relatively late in Christie’s oeuvre, having been published in 1961. It seems to me to be informed by a somewhat more worldly sensibility, as compared to the author’s earlier works. The wit sparkles, and a sense of irony percolates just beneath the surface of the narrative. The allusions to Shakespeare are apt, enriching, and relevant. But above all, there is the supreme inventiveness of the plot. All along the way, from beginning to end, Christie scatters crucial bits of information like crumbs dropped by Hansel and Gretel. It is only as the action reaches its climax that you fully comprehend their significance. He’s hit the nail on the head. There’s a fair amount of discussion in this novel of the nature of evil, and it isn’t merely idle speculation. It is informed, and rightly so, with a sense of urgency. Mark Easterbrook, his friend Ginger Corrigan, Inspector LeJeune, and the vicar’s wife Mrs. Dane Calthrop – all know that they are up against a truly fiendish conspiracy. It will take more than talk to break its back. It will take action, and a willingness to put one’s life on the line. What a great review! 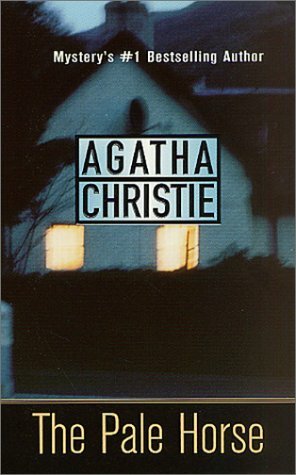 This is one of my very favorite Agatha Christie books. I’ve lost count of the number of times I’ve read it. This is one of those Christie plots in which obfuscation plays such a HUGE part. And yes, I love the ‘romance’ part of it as well. Such fun.